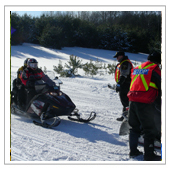 Trail Patrol Officers are dedicated snowmobile club volunteers who regularly patrol Ontario's snowmobile trails, provide valuable trailside information to snowmobilers and promote the provincial user pay system. 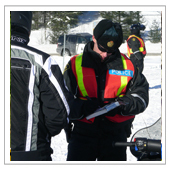 For the individual who desires to contribute to recreational snowmobiling a unique opportunity exists to join the Trail Patrol Program. It demands an adventurous spirit and a high degree of personal integrity. You will often deal in unstructured situations that will test your resourcefulness. For further information contact your local district. Question #1: Can Trail Patrol Members patrol on OFSC Prescribed Trails that are on private property when the trails are closed? Short answer... yes. Trail Patrol Member's duties and responsibilities are all centered around activity on OFSC Prescribed Trails. Although the program was designed to patrol on open trails, as this is where having a permit is law, patrolling off trail is a valid and sometimes necessary activity. According to the spirit of the Prescribed Snowmobile Trail Land Use Permission, the club has a moral obligation to attend to issues arising from the existence of the trail both before and after the winter months when activities relating to opening, closing, upgrading and maintaining are taking place. Therefore, Trail Patrol Members can patrol on closed trails. Question #2Can they lay trespass to property charges on a closed trail? Short answer... yes. It is illegal to ride on a closed trail on private land, whether or not the sled has a permit. The permit makes riding on a trail legal, only when the trail is open. Therefore, a Trail Patrol Member, as the agent for the landowner, has the authority to lay a Trespass to Property charge on a closed trail even if the sled has a permit on it. The best course of action depends on circumstances, of course. Has the landowner complained of sled activity before the trail is open? Are sledders continuing to ride after repeated warnings from the club? In these cases, laying a charge might be the right action. Keep in mind that the Trail Patrol Member is a snowmobile Ambassador and should do everything in his / her power to build goodwill with riders. An alternative to laying a charge may be to ask the sledder to leave the trail and maybe even issue a warning. Explain the potential dangers and the requirements of club volunteers to prepare the trail properly so it can open as soon as possible. Question #3: Can Trail Patrol Members sell permits on a closed trail? Short answer... yes. Although the intent of the program is to sell permits on open trails, as this is where Bill 101 and the MVSA makes having a permit a legal requirement, Trail Patrol Members are not restricted to selling just on trail. They can sell permits at any time or place, on trail and off trail if the rider agrees. However, they only have the 'authority' to sell on the trail (where the permit is a legal requirement). The only stipulation is that they only sell a seasonal permit at the after Dec. 1st price. "My sled seized (cause still unknown) on the 'E' trail south of Harcourt. As I was riding solo, I was prepared to start walking until Bill and Bob provided much needed assistance. They got me out of the bush, and to the highway where I was able to have my sled trailered to Little Gull Marina in Buckhorn, where my cottage is located. Please pass along my sincere thanks for a job well done. Also, a thank you to the kind family of three who also assisted in towing my sled to hwy 118. Keep up the great work!"